Introducing an amazing Red Queen Bundle available for purchase only at ThePSPProject store, check out the tutorial I have written up for you, and stop by the store to catch this amazing deal today. 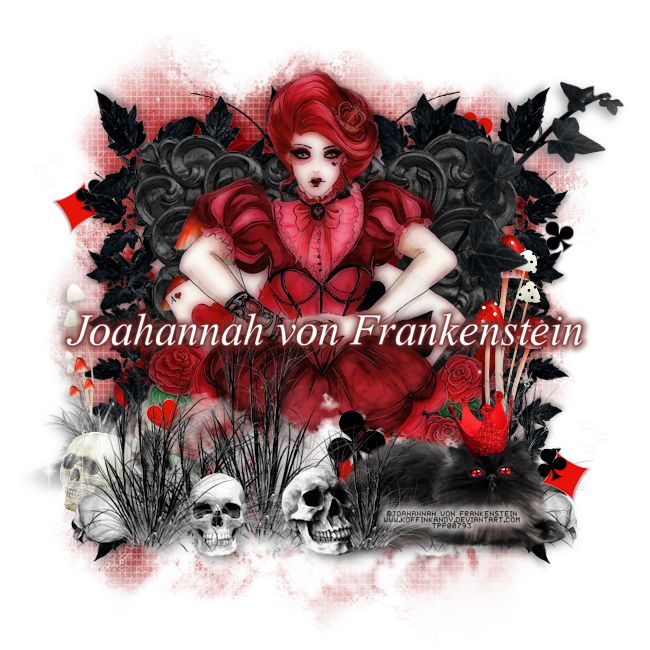 "Red Queen"
You must have working knowledge of Corel Paint Shop Pro X2 or newer Okay Ready, set, GO! Open a new canvas 650 x650 Copy and paste IPD_Cora_Paper4, into your new canvas, next step is to turn this layer to a masked layer. Head to your layers tab-->Load/Save Mask-->Load Mask from Disc From there choose Vix_BigMask018. And Click Load Now you want to Merge group Using your mouse, mouse over your layer where you had paste your paper at, and right click on your mouse Next it will pop another option for you, you want to look for "Merge"--> "merge group". Tada you have a masked layer. Next open these elements, re-size according to my specifications, add a drop shadow if you wish to do so, then copy and paste into your canvas. (If I had left the re-size % out, it's because I did not have to re-size). Now onto you ELEMENTS FOLDER: IPD_Cora_Element73, re-size to 75% IPD_Cora_Element75, re-size to 80% IPD_Cora_Element76, re-size to 30% and 35%, duplicate 10x, and spread them around to make a rectagular border. IPD_Cora_Element60, duplicate 2x, paste it on top and bottom over IPD_Cora_Element76 IPD_Cora_Element74, re-size to 67% IPD_Cora_Element18, re-size to 50% IPD_Cora_Element81, re-size to 20%, and place this in front of rabbit in IPD_Cora_Element18 IPD_Cora_Element19, re-size to 43% IPD_Cora_Element77, re-size to 80%, so my signature to place the vine of leaves at. IPD_Cora_Element3, re-size to 60%, duplicate 2x mirror one of them, and place side by side [[see my signature for example]] Right at this point you will want to add your half tube and place it behind the grass of skulls. IPD_Cora_Element95, re-size 50% and place the cat in front on the grass of skulls. IPD_Cora_Element21, re-size 12%, apply mirror effect and sit it on top of IPD_Cora_Element95 Place the elements into your canvas, according to the extra instructions. AND Now Add your copyrights of your tube and your license. Add your name. And your done.